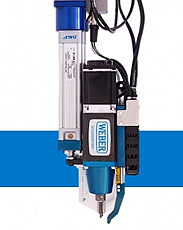 Weber Screwdriving is a leader in a wide range of fastening processes and technologies including handheld, fixed station and robotic screw driving. Multi-screw feeders using a step feeder design allows for positive, quiet and high speed orientation and placement. Interchangeable tooling provides flexibility from 10mm up to 95mm in length with one set of tooling. Feed while you drive is a specific design feature that delivers higher cycle rates by pre-presenting the screw while a screw is being driven. Control modules that are compatible with Ethernet IP and Profibus communications are available on the C30SxM controller. Other controllers are offered as well.